20 years after the events of the first film, Renton returns to Edinburgh. In 1996 a little British movie named Trainspotting pulled into cinemas. We were assured this was the movie to give the then commercially ailing British film industry a shot in the arm and release it from the ghetto of polite period dramas (as if the likes of Mike Leigh, Alan Clarke and Ken Loach were chopped liver). We had heard the same thing said about Danny Cannon's The Young Americans and Paul WS Anderson's Shopping, and we would hear it repeated in the coming years with Guy Ritchie's Lock, Stock and Two Smoking Barrels. Trainspotting may not have put British cinema back on the global map (its Scottish accents meant it was largely shunned by American audiences), but for a while it became a cultural phenomenon in the British Isles, one that transcended the film itself, its marketing and soundtrack playing a huge role in its appeal. Though the phrase was yet to be coined at the time of its release, Danny Boyle's followup to his superior 1994 debut, Shallow Grave, became the banner film for the 'Cool Brittania' movement. Unlike previous British pop culture movements (Teddy Boys, Mods, Northern Soul, Punk, Acid House et al), which were built from the ground up, CB was a reverse invention of magazine editors, record label owners and fashion designers. Despite having little in common, the likes of Liam Gallagher, Tracey Emin and Tony Blair(!) were lumped together and sold as the protagonists of a revolution. Compared to the real cultural revolts mentioned above, CB is one looked back on now largely with a sense of embarrassment. Today we live in a world that requires you to dig beyond the hype to find anything of cultural interest, one where mainstream cinema has largely given up on original concepts, and so we have T2 Trainspotting, which arrives a year after its intended 20th anniversary - perhaps that's a sly commentary on British trains? At the end of the first movie, the impossibly glamorous heroin addict Mark Renton (Ewan McGregor) absconded with the proceeds of a drug deal that should have been shared with his even more glamorous heroin addict friend 'Sick Boy' (Jonny Lee Miller), nice but dim heroin addict 'Spud' (Ewen Bremner), and sociopathic boozehound 'Begbie' (Robert Carlyle). This sequel sees Renton return to Edinburgh with the intention of making amends with Sick Boy, who swapped heroin for cocaine and now ekes out a living blackmailing the clients of his Bulgarian prostitute girlfriend, Veronika (Anjela Nedyalkova). He's oblivious to the fact that Begbie has escaped from prison, where he's spent the past two decades on a murder conviction, and returned to Edinburgh. The 1996 movie was a tonal mess, transitioning from an opening hour that consisted of a series of sitcom-esque vignettes that relied too heavily on (sometimes literal) toilet humour, before morphing into a half-baked crime caper in its final act. Narratively, T2 is another car crash. It's never quite sure what story it wants to tell. Is it the story of Spud's attempt to go straight by explorring his talents as a writer? Is it the story of Begbie's quest for revenge against Renton? Is it the story of Sick Boy's plan to con the EU into funding his brothel? All three subplots could probably support their own movie, but Boyle and screenwriter John Hodge chop them up and serve them in superficial fashion. It's a bit like going to a craft brewery and sipping on the taster platter all night rather than getting a few pints in. Boyle's sequel does have its moments, the best of which are a Blues Brothers inspired encounter between Renton and Sick Boy and the drinkers at an Orange Lodge, and a tense chase sequence that suggests the director should lend his talents to a slasher movie. 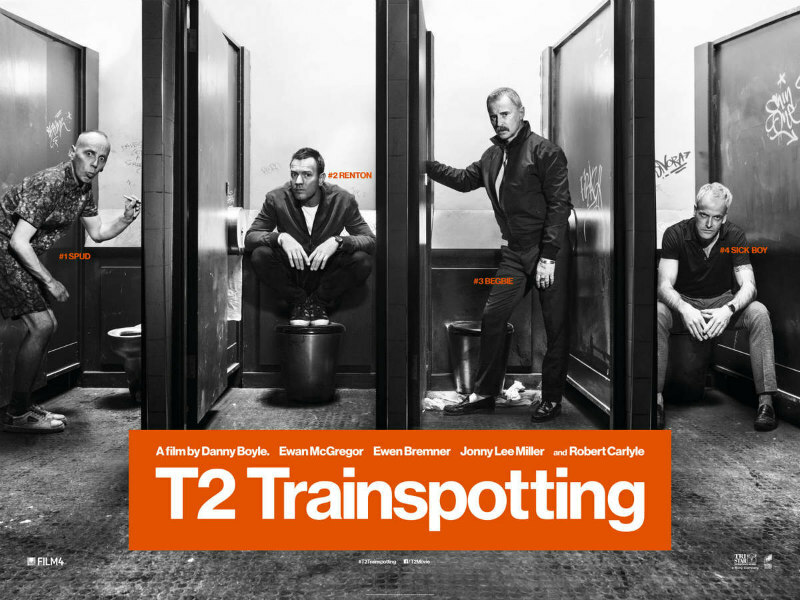 Even more so than its predecessor, T2 has little interest in exploring the reality of heroin addiction; it's a stylish and superficial middle class fantasy of a problem that continues to blight working class communities across the British Isles. Embrace the fantasy, if you can, and there's enough to keep you entertained here (otherwise rent Heaven Knows What for a genuine portrayal of the lives of inner city addicts). Unlike other revived franchises, T2 boasts a cast who slot back into their roles with a natural ease. It's clear these actors have a lot of affection for these characters, as do a generation of British and Irish movie-goers. Your enjoyment of this reunion will likely depend on your own level of sentiment for their creations. Those familiar with the real-life Rentons, Spuds and Sick Boys may not be quite so eager to welcome them back. T2 Trainspotting is in UK/ROI cinemas January 27th.